Lake Tahoe ski resorts could receive 1-3 feet of snow by Friday morning (Nov. 30). Snow continued Wednesday at Lake Tahoe ski resorts, but most resorts received only modest amounts of snow by Tuesday evening. Squaw Valley Alpine Meadows expects 4 to 8 inches of snow Tuesday and up to 21 inches by Thursday morning. Squaw Valley Alpine Meadows was one of the big benefactors from the snow on Tuesday and Wednesday. 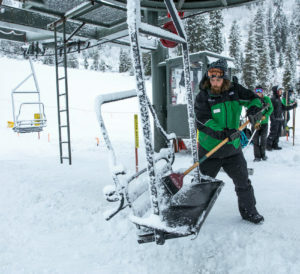 The upper elevations at Squaw Valley Alpine Meadows saw up to 7 inches in the last 24 hours and it was falling heavily at higher elevations Wednesday. Squaw Valley Alpine Meadows spokesperson Liesl Hepburn said the resort expects 4 to 8 inches today and up to 21 inches by Thursday morning. The snow is expected to continue all day Thursday. The National Weather Service (NWS) in Reno has upgraded a winter storm watch to a winter storm warning, with heavy snow expected between 10 p.m. Wednesday and 4 a.m. Friday. During that time, 1-3 feet of snow is possible above 7,000 feet. Lake level (elevation 6,225 feet) could receive 3-6 inches of snow. However, the storm will also deliver high winds. The high country could see wind gusts as strong as 60 mph, while South Lake Tahoe and Incline Village might see winds up to 25 mph. Another cold storm is expected to move through the Lake Tahoe region Saturday, bringing 4-8 inches of snow. There could be 2 to 3 feet of snow at the upper elevations by Sunday. The NWS expects another storm to arrive by Tuesday (Dec. 4) and continue into Wednesday. And this very active storm pattern may continue through the second week of December. Sugar Bowl ski resort in Lake Tahoe anticipates it will open for the 2018-19 season Friday, Nov. 3. There are currently six Lake Tahoe ski resorts open – Squaw Valley Alpine Meadows, Heavenly Mountain, Northstar California, Mt. Rose, Kirkwood Mountain and Boreal Mountain. Two more resorts – Sierra-at-Tahoe and Sugar Bowl – are expected to open Friday (Nov. 30). Diamond Peak ski resort has plans for a Dec. 13 opening and Granlibakken opens Dec. 14. 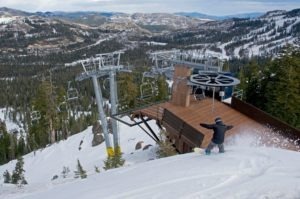 Tahoe Donner and Homewood Mountain have not announced opening dates yet.